True comfort experience with the plush reclining options from the Hitchcock Collection. 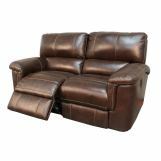 The power reclining chair, loveseat, and sofa each allow you to kick back and relax with the touch of a button. 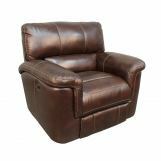 Pad-over-chaise seats ensure comfort from head to toe, enhanced by padded split backs and generous pillow arms. 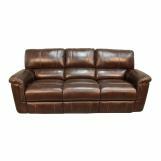 Accent stitching across the Cigar finished leather add a sophisticated touch to the casual designs, and the rich tones ensure the pieces will complement any home. Take home the whole collection for the ultimate entertainment space, or pick your favorite piece to stake your claim on the best seat in the house. 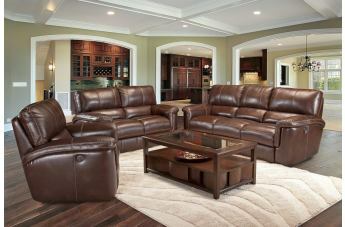 Whatever your decision, the Hitchcock Collection promises supreme comfort with relaxed style.